Historically a blue-collar fishing town, Rockland has had a recent facelift. The somewhat derelict main street is now somewhat revitalised, enhanced by attractions like the Farnsworth Art Musuem, Wyeth Center, and a number of shops and restaurants. Rockland has enough interesting attractions for a perfect weekend break in Maine, including the Maine Lighthouse Museum and the Owl's Head Transportation Museum. Active visitors can take a walk to the Breakwater Lighthouse or catch a ride on the Maine Eastern Railroad. 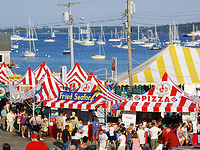 Rockland exists as the home of the Maine Lobster Festival, held each August, and it also hosts the North Atlantic Blues Festival every July. Rockland also makes a great base from which to explore the Saint George Peninsula and the islands of Penobscot Bay: Vinalhaven, North Haven, and Matinicus.